Kanban Cards: How We Keep Our Shipping Department Organized! Click to download free Kanban Card sample Excel file! The part number matches the manufacturer part number of the supplier, making it easier to find and order additional parts. For example, 5522172, when searched on the MSCDirect website, will give you the correct 3/8″-16 Screw. 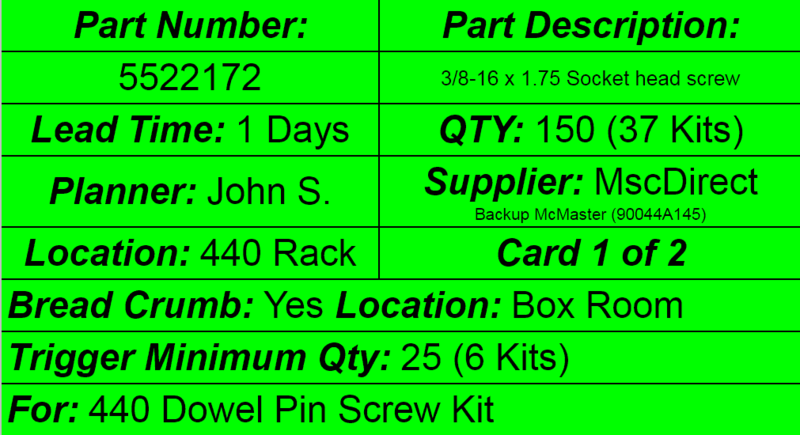 The part description denotes which part each card is for, letting us grab parts we need without having to look up the part number on the supplier website to double check. The Lead Time is the amount of time it will take to get new parts in or made, letting us know how far in advance to order new stock. This Quantity is the maximum amount of stock we usually keep. If the part is one piece in a kit or larger product, this box also tells us how many kits can be made with the maximum stock. The Planner is the employee in charge of ordering new parts when the need arises, and should get the card to place an order when the stock is depleted. The Supplier is just as it sounds, the company we order the parts from. In the event there is a secondary supplier (like the above Kanban card) the other distributor is also listed, along with the secondary part number. The Location of the part is where the part is generally found, and not the location of any overstock. For example, the picture above notes that the screws are primarily found in an organization bin on the 440 Rack, but also have a Bread Crumb in a different location. The Bread Crumb provides an alternate location, should the part run out in its original location. Not every part has a Bread Crumb, but with certain items we keep additional stock elsewhere. For example, we keep additional stock of the screw whose card is pictured above in the Box Room, which has a second Kanban card for the part that should be given to the Planner if out of stock there as well. The Trigger Minimum Quantity denotes the minimum amount left in stock before more need to be either ordered or replenished from their Bread Crumb location. This box also tells us how many parts or kits we can make with this minimum amount. This box gives a quick note on what each part bin is for. The part for the card shown above is part of the Dowel Pin Screw Kit for our Tormach PCNC 440 Fixture Plates.